Project Tomorrow, a national education nonprofit group, announced the selection of several schools from Salisbury Township School District as Speak Up 200 schools. Speak Up 200 schools are a collection of top K-12 schools in the country that encourage and involve authentic student, parent, and teacher ideas and views in the education planning and decision-making. More than 379,000 K-12 students, teachers, administrators and parents, representing 6,541 public, private and charter schools from all around the country participated in the Speak Up 2010 surveys which were open for participation in fall 2010. Director of Data and Technology, Dr. Randy Ziegenfuss said, “The Speak Up survey provides important data about students, parents, teachers and administrators that other surveys do not capture. The Speak Up responses provide us with an extra dimension of data that helps us think, plan and act for an exciting but unpredictable future in education. Our Speak Up survey data from 2010 reinforced the belief that we need to provide our students with increased learning opportunities while reducing budgetary costs – the driving force behind Teaching and Learning 2014 (TL2014).” TL2014 is the District’s learning initiative that includes providing each student in grade 6-12 with a laptop computer, professional development for teachers and administrators and education workshops for parents. 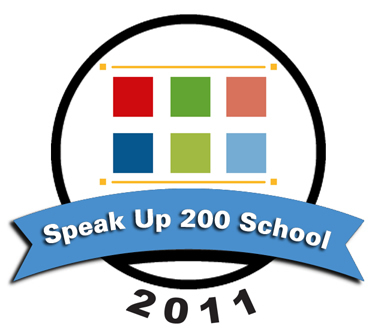 Speak Up 200 schools will be prominently featured on the Project Tomorrow website. Additionally, Project Tomorrow will promote our distinction to Representative Charlie Dent and Governor Tom Corbett to demonstrate the power of educational innovation at the local level. Visit this link to learn how to take the Speak Up 2011 survey. Project Tomorrow is the nation’s leading education nonprofit organization dedicated to the empowerment of student voices in education. With 15 years experience in the K-12 education sector, Project Tomorrow regularly provides consulting and research support about key trends in K-12 science, math and technology education to school districts, government agencies, business and higher education. For additional information, visit: www.tomorrow.org. The Speak Up National Research project annually polls K-12 students, parents and educators about the role of technology for learning in and out of school and represents the largest collection of authentic, unfiltered stakeholder voice on digital learning. Since 2003, over 2.2 million K-12 students, parents, teachers, librarians, principals, technology leaders and district administrators have shared their views and ideas through Speak Up. Education, business and policy leaders use the data regularly to inform federal, state and local education programs. Students in Mrs. Young’s fourth grade classroom at Harry S Truman Elementary School are using Falcon Apps to enhance their learning. As part of the fourth grade curriculum, students study the different kingdoms of living things. Mrs. Young’s students each researched an animal to determine the animal’s kingdom and whether it was a vertebrate or invertebrate. Students used the Destiny catalog to access websites for information. As students found information and pictures they shared their findings in Falcon Apps, creating a shared presentation. In the past, students have researched topics and prepared presentations using Keynote and PowerPoint. However, Falcon Apps allows the students to take their learning to the next level. The students were able to work collaboratively online to create a shared document and compile findings in one location. Students developed technology skills, collaboration skills and research skills including media literacy and information literacy while learning important content. Tips on using Google more effectively and efficiently. An excellent resource of learning tools – many collaborative. Looking for a free drawing tool. Here are links to 11. These free tools offer opportunities for struggling learners to achieve academic success.